Thanks to having had a rematch clause put in place before the fight, Saul Canelo Alvarez now appears to be in the driving seat as regards to the possibility of a rematch between he and middleweight king Gennady Golovkin. Most fans feel GGG was the rightful winner this past Saturday, only for the 160 pound, years in the making Super Fight to be scored a draw. Now, according to a piece on ESPN.com, both sides will sit down this week to discuss the rematch that basically seems inevitable. Both fighters acknowledge the fact that fans everywhere want to see the rematch, while both great fighters seem to genuinely want it for themselves. There are, however, a couple of possible snags as far as the fight getting made for each fighters’ next outing. Reportedly, Canelo has zero interest in fighting again until next May 5, over his country’s Cinco de Mayo weekend celebrations. 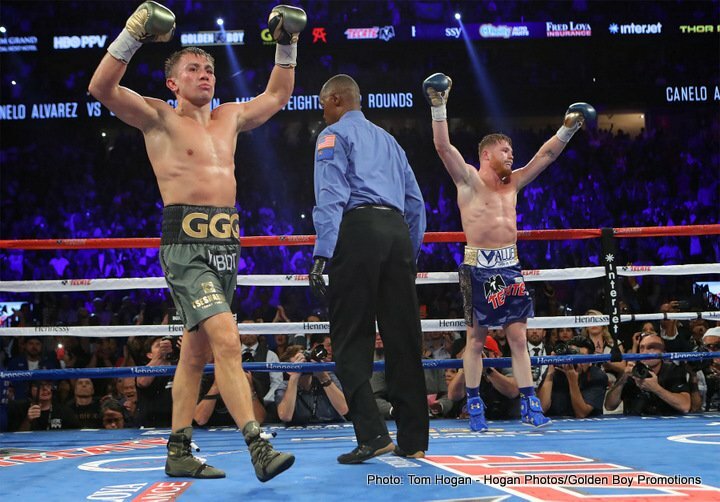 This date seems to be a natural as far as holding the sequel, and though GGG has no problem with it, he will now wait and see if Canelo actually enforces his rematch clause – which he must do in three weeks. GGG does not want to sit around and wait, not at age 35, and unless the May 5 date IS finalised, Triple-G may well take another fight, possibly in December, possibly against either Miguel Cotto or Billy Joe Saunders. Tom Loeffler, GGG’s promoter, makes it clear: the Canelo rematch is his fighter’s priority, but until Canelo confirms he wants the rematch and the two will definitely fight in May, Golovkin is looking at other options. But as Eric Gomez of Golden Boy points out, there is always the possibility GGG could actually lose such an interim fight; and if so, how would this affect the biggest rematch that can be made in all of boxing today? But could it also be risky for GGG, a significantly older fighter than Canelo, to remain idle for almost eight months? Triple-G wants to keep active so as to remain as sharp as he possibly can. But right now, it appears to be all down to Canelo: he either confirms during this week’s coming talks that he’s all set for the return fight in May (and why wouldn’t he be, as sure as he tells us he is that he won the first fight?) or GGG will possibly go shopping for a December opponent.